Globe High School senior Robert “BJ” Burries Jr. entered his January 8th game against San Carlos Secondary School with 2,993 career points, which put him third for all-time in the state of Arizona. “BJ,” a nickname known for him throughout the San Carlos Apache reservation grew up playing “RezBall” while also competing in off reservation tournaments and leagues. “When I began with UNITY at 13, it was at a time that I knew I had a story to share but I didn’t know how to share it. UNITY gave me the tools I needed to be comfortable speaking in front of a large crowd. 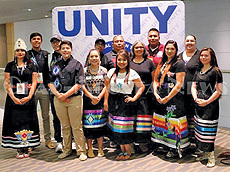 When I served as UNITY Co-President, I gained more,” said Dan Terrio, who was featured as a TEDx Talk speaker earlier this month.